Car rental Tarragona is a must for exploring the city ​​with unique ancient history, golden beaches of Costa Dorada, many spots offering traditional Catalan cuisine, making our car rental services a perfect deal for you! You don’t have to compare car rental prices anymore - we’ll do it for you! Use our web form to add your location and we’ll find you the most affordable car rental variant from 30,000 car hire offices worldwide. If you want to get a reliable rental car for the cheap price – leave it to us! Using car rental Tarragona you can visit the ancient Roman amphitheater which is the symbol of the city. Then go to Royal Square where is an archaeological museum of Tarragona, a circus and a museum with exhibits of ancient Roman underground. The famous Roman Forum is a must see because it’s a part of UNESCO World Heritage. 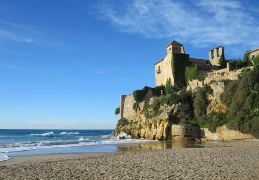 Many splendor beaches are also waiting for you in Tarragona! RentalCars24h.com offers you reliable car rental Tarragona services that will help you to feel free and independent when moving around the town. Providing best online prices for car hire Tarragona services, RentalCars24h.com allows you to save money each time when you rent a car in Tarragona.